Thangka der zornvollen Form des Buddhas Akshobhya, Guhyasamaja-Akshobhyavajra. Hier tritt er in YabYum vereint mit Sparshavajra auf. Er schützt vor negativen Energien bzw. wandelt sie in positive Weisheitsenergien um. Sehr liebevoll gemalter Thangka unter Verwendung von Gold. Thangka of Guhyasamaja-Akshobhyavajra. He is the wrathful form of Akshobhya. This protector deity transmutes all negative energies into positive energies. 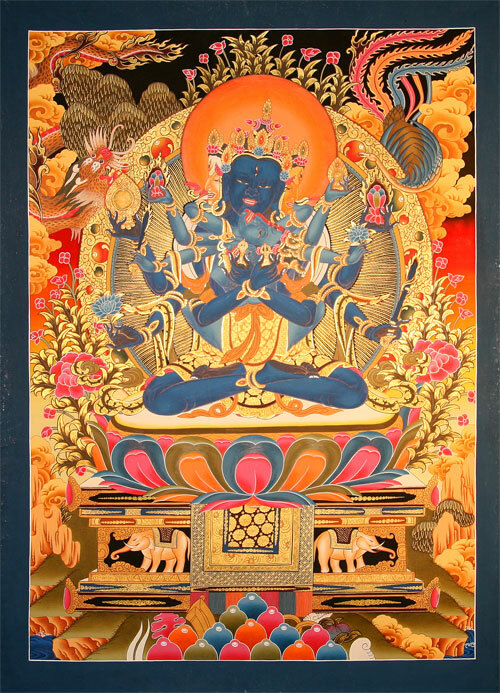 An enchanting thangka painting with the use of real gold.